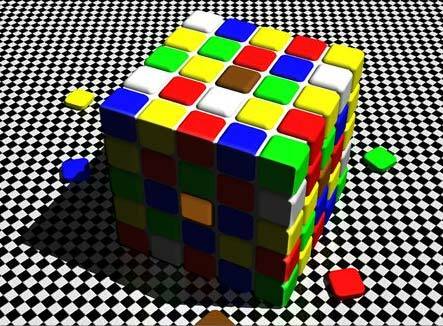 The central squares on the top and near surfaces of this cube appear very different: brown and orange, respectively. If you move your mouse of the image part of the image will be removed but the two square remain exactly the same. This reveals their "true" physical similarity. This image is reproduced with the permission of R. Beau Lotto. © 2000 curiouser.co.uk All rights reserved.